Ideal for recording events while you are driving. The Car Cam has two cameras built-in - One looks out at the road - the Second one looks into the car. Perfect for Taxi drivers, truck drivers, haulage companies, bus companies. Record video AND sound. Are you fed up getting the blame for somebody elses bad driving? Now you can cheaply keep a record of your driving day. You can quickly play back events using the built-in 2" colour screen or connect it to your laptop for easy copying to hard drive, CD, or USB stick. 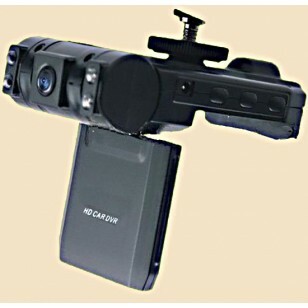 Don't get caught out, get CarCam Duo!